We admire lush green lawns and plants as well as flowers in bloom. To look their best plants need adequate nutrients and generally in the right proportions. Lawns usually need more fertilizer, especially nitrogen. Flowers need phosphorus. Newly planted shrubs also need to be fertilized. However, once established they often need little. We fertilize for optimal turf health and appearance. Frequent applications at reduced strength provide healthy green grass at your site year-round..
We offer numerous lawn fertilization programs. We designed each to satisfy differing turf fertility needs. Our fertilizer programs keep lawns looking lush green. Compare our service to others. Don’t be surprised to see our lawns looking great for most of the year—including much of the winter. Only extremes in weather force a downturn. We use very high quality fertilizers that include exceptionally high levels of slow release nitrogen for sustained growth. We pay a premium for our products; our customers reap the benefits! Each program includes an application of lime in the winter which helps to raise the pH. Don’t worry about trying to figure out which one you need. We’ll help with that. Almost all lawns that have been planted in the last twenty years are ryegrass. It is a hungry grass and needs a constant supply of nitrogen or the turf will lose color and look yellowish. This program includes six applications per year. These are native grasses to Oregon and can get by with little to no additional fertilizer. However, most people prefer the darker green color that comes with regular fertilizing. For these grasses we use a reduced rate. Otherwise they may grow excessive thatch. Some people don’t water in the summer for various reasons. We don’t want to fertilize a dry lawn, so we have a program for this as well. If you only need semi-monthly lawn mowing, fertilizer needs to be cut way back. This program includes only fall and winter applications plus lime. Naturally, the appearance will suffer. A need for reduced cost drives this service. We don’t encourage it but have chosen to satisfy the need of the customer first. In each case the plants need fertilizer—anywhere from one to three times per year. Generally a late winter application is enough but new plants also benefit from a second application in late spring. 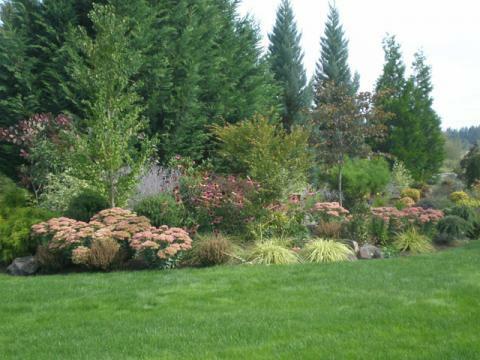 Well established plants in the Portland area usually need little additional fertilizer. However, new plantings need to grow. As a result we offer shrub fertilizing at two times. Late winter. At this time we fertilize most or all plants in your landscape. 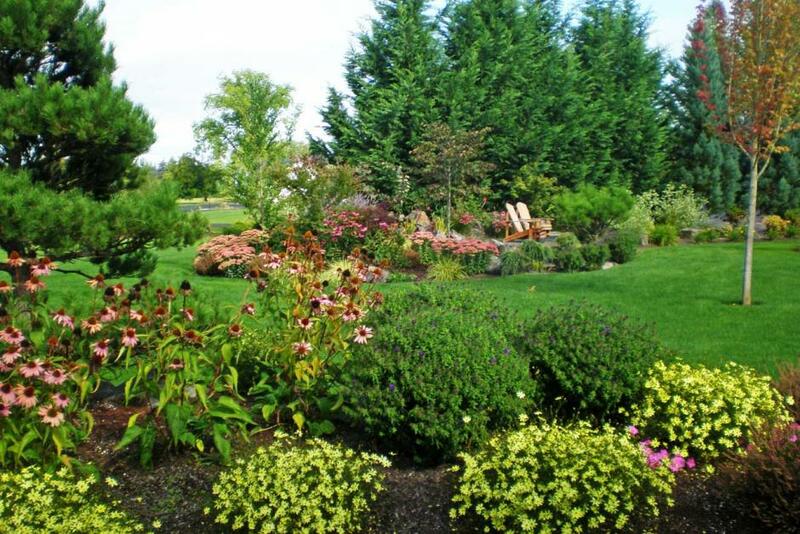 We routinely include this application of shrub fertilizer with a complete landscape maintenance program. Otherwise at least some plants won’t do well. However, mature, healthy plants may be skipped. Otherwise they just grow bigger and need more pruning—a waste of time and money. Late spring. This application is used just for plants that we want to grow. Trees, and some shrubs as well, do best with a special type of fertilizer that is applied directly into the root zone. This is called Deep root feeding. We use special equipment to inject liquid fertilizer directly into the root zone. Surface runoff becomes impossible, and the roots can immediately absorb the needed nutrients. Many people prefer an organic based approach to fertilizing. We all want sustainable practices in every way that is practical. We offer products and service to satisfy this need. There are some caveats, however. Organic based products cost more. As a result we charge for each application and do not include this type of application in a monthly fee type of program. Turf color is not as dark of green and not as constant. Why? Organic based products rely on warm soils and moisture so microorganisms can break down the fertilizer into useable plant food. During cooler weather this won’t happen. 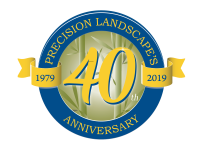 A hybrid program brings the best of both worlds by using organic based fertilizers during warmer weather and traditional products during cooler weather.